About 3,000 people took part in annual Jewish pilgrimage to Ghriba synagogue on island of Djerba. 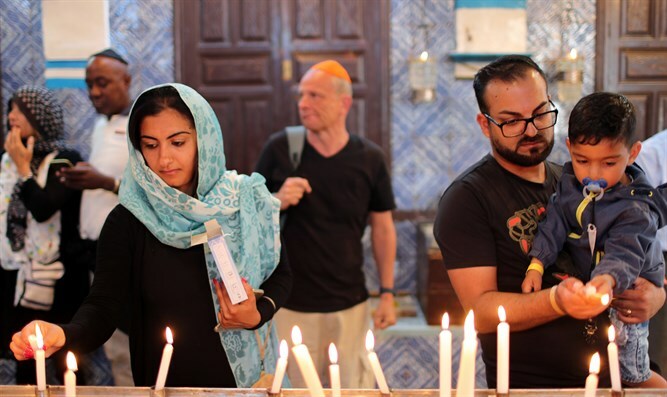 The annual Jewish pilgrimage to the Ghriba synagogue on the Tunisian island of Djerba ended on Thursday night without incident under heavy security, AFP reported. About 3,000 people took part in the first day of the festivities, celebrating the Lag Ba’Omer holiday. The joyful march usually makes a tour of other synagogues and Jewish neighborhoods on the island before returning to Ghriba, but in recent years, celebrations have been confined to Ghriba for security reasons. According to Rene Trabelsi, co-organizer of the annual pilgrimage, nearly 400 Israelis took part in this year's festivities. Organizers expected between 5,000 and 6,000 pilgrims to visit the synagogue, around twice as many as in 2017. In 2013, only 1,000 pilgrims visited the synagogue amid security concerns. In the past, thousands would flock to the synagogue for the annual Lag Ba’Omer pilgrimage. The community is still recovering from a suicide bombing at the synagogue in 2002 that killed 21 people. Before the attack, some 8,000 pilgrims used to travel to Djerba for the annual celebration. Around 3,000 had returned after the attack, prior to the revolution that toppled former strongman Zine El Abidine Ben Ali in January 2011. The event was cancelled that year with the country on edge after the mass uprisings, but it resumed discreetly in 2012 and no incidents were reported. Although the security situation in Tunisia has improved over the past two years, authorities remain wary. A state of emergency imposed after a series of attacks on tourists and security forces in 2015 remains in place, having been extended in March for another seven months.